In the Legends continuity, Luke Skywalker's attempt to rebuild the Jedi went very differently. Restarting the Jedi Order is no small feat. We saw the problems that Luke Skywalker ran into on the big screen recently in “Star Wars: The Last Jedi.” However, in the Legends continuity he faced a very different set of challenges, while ultimately succeeding in bringing the Knights back. 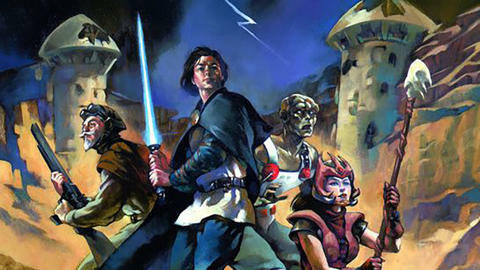 Writer Kevin J. Anderson chronicled many of these exploits in a trilogy of novels called “Jedi Search,” “Dark Apprentice” and “Champions of the Force.” Set on Yavin 4, Luke brought together and trained Kyp Durron, the beast master Kirana Ti, weather-controller Streen and historian Tionne. 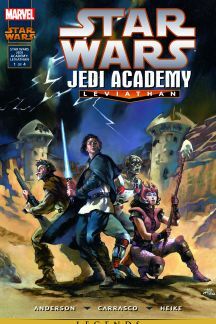 Set after the events of the book series, STAR WARS: JEDI ACADEMY – LEVIATHAN explored the next step in their training: a solo mission to the mining planet of Corbos. 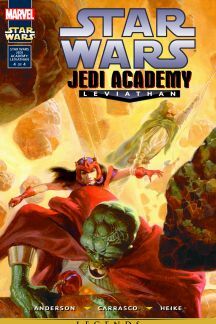 The four issue limited series, originally published in 1998 and 1999, came from the minds of Anderson and artist Dario Carrasco, Jr.. After the Corbos miners uncovered something dangerous, they sent out a distress call that Leia forwarded along to her brother in hopes that the Jedi could investigate. Around that same time, Dorsk 82 – the clone of deceased Jedi Academy member Dorsk 81 – arrived on Yavin to see if he exhibited similar abilities as his predecessor. When Skywalker sent Kyp to Corbos, Dorsk 82 tagged along as well. Once on-planet, our heroes soon discovered that the mining colony had been absolutely ravaged by a monstrous creature of some sort. Back on Yavin, Tionne did some research, discovering Corbos’ history of losing entire colonies. At the same time, Dorsk 82 decided to call Kyp’s comrades for help after the Knight ran off to tackle the problem on his own! The monster turned out to be a Leviathan, a creature that absorbed its victims’ memories so that it could more efficently destroy the colony. Kyp soon discovered, after coming face to face with the creature, that it kept the victims’ souls inside orb-like holding cells on its back. While Kyp battled with one Leviathan, Dorsk 82 met up with the recently-arrived Kirana Ti and Streen and ran into their own batch of trouble. Reunited after Durron felled his foe, the group soon realized they had a much larger Leviathan to deal with! The group then worked together, even integrating Dorsk 82’s information and talents, to ultimately defeat the creature. Along the way, they freed the souls, proved their worth as Jedi and even showed Dorsk that he need not lead a life fueled by fear. 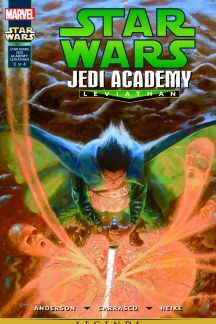 Star Wars fans with younger readers might know the title “Star Wars: Jedi Academy” as something else altogether. 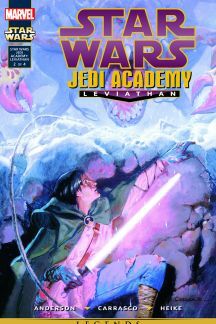 Cartoonist Jeffrey Brown created a three book series with that same title exploring the trials and tribulations of school through the lens of a galaxy far, far away. Before that Brown also worked on the “Darth Vader and Son” book which kicked off a four-part series that also included “Vader’s Little Princess,” “Goodnight, Darth Vader” and “Darth Vader and Friends.” All of these books make for great entry points for young Star Wars fans! Next week we check back in on X-WING ROGUE SQUADRON with the Phantom Affair story from #5-8.